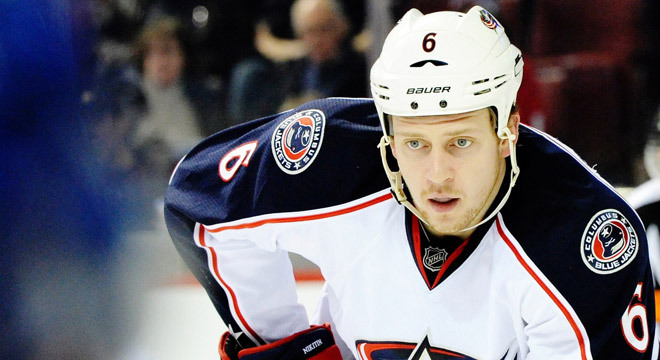 Nikita Nikitin is a hockey player whose background and resume refute all forecasts and expert opinions. He is the only player in the NHL to come from Omsk. He was never included in the top lists of European prospects (he was 136th overall in the 2004 NHL Draft), and even at home in Russia, playing in the Avangard farm club, he did not stand out for anything except his strapping dimensions, which are very desirable in a defenseman. That Nikitin was asked to join Avangard’s first-tier team for the 2004/05 season was especially surprising. At the time, Avangard was considered one of the richest – if not the richest – team in the Russian Superleague. It could afford to sign up stars like Oleg Tverdovsky, Pavel Patera, Jiri Slegr and, of course, Jaromir Jagr. However, Avangard coach Valery Belousov saw something in the unseasoned 18-year-old Nikitin and began making him a regular on the main team. During 16 matches in a regular championship, Nikitin did not score a single point and distinguished himself only for a four-minute penalty. But the following year, Nikitin won a Silver Medal at the World Junior Championships playing for Russia alongside Evgeni Malkin, Alexander Radulov and Alexei Emelin. He also began playing steadily for Avangard. Still, it wasn’t so easy to win the hearts of Avangard fans. Though Nikitin’s stats for the 2006/07 season were perfectly respectable (he racked up 20 points), the attitude toward the player in the stands ranged from slightly condescending to downright negative. As a classic stay-home defenseman, Nikitin lacked the necessary toughness and positional intuition; as an attacking defenseman, he lacked the requisite speed and accuracy. Fortunately for Nikitin, teams are put together not by fans, but by experts. Nikitin’s not showy, but useful style of play attracted the attention of Russian team coaches who invited him in September 2009 to play in one of the European Hockey Tour tournaments, the Czech Games. In the summer of 2010 Nikitin suddenly let it be known that he would like to try playing in the NHL. At the time, he was probably the only person in the world who thought he stood a chance of doing well in the West. When he arrived in St. Louis after summer training camp, Nikitin wound up as might have been expected in the AHL. But after 22 matches for the Preoria Rivermen he was invited to join the first-tier team. During 41 games for the St. Louis Blues (NHL), Nikitin racked up only nine points and experts on both sides of the Atlantic were predicting his return to Russia. However, St. Louis asked Nikitin to sign another contract, and he stayed put although, by October, after only six games, Nikitin had been moved to the reserves. He came out and played against Edmonton, then went back to the reserves for another two weeks. By Nov. 10, St. Louis had traded Nikitin to the Columbus Blue Jackets. Playing for Columbus, Nikitin was teamed with fellow Russian Fedor Tyutin and given more ice time than he had seen since playing on junior teams — more than 25 minutes per game. During 41 matches for the Blue Jackets Nikitin racked up 22 points, and proved to be an excellent passer. It’s still too early to predict whether Nikitin will play on the Russian team at the next Olympics, but if his game continues to develop at the current rate, it’s not unlikely that he will be on the ice in Sochi in 2014. Nikitin has never had any idols. He is fond of fellow Russian hockey players Sergei Fedorov and Sergei Zubov. Nikitin’s closest friend is his old Avangard teammate Vladimir Pervushin. Nikitin went to the United States with his girlfriend Svetlana, whom he met in Omsk. They have known each other for five years and were recently married.